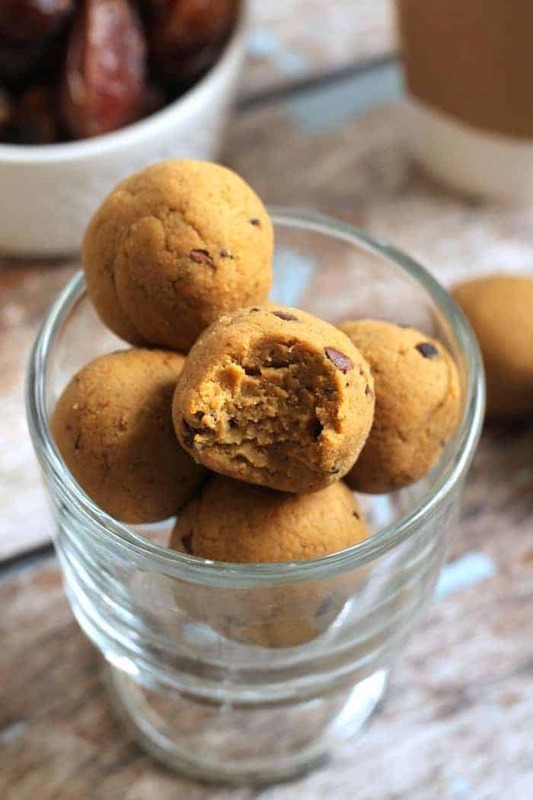 These easy, cakey Pumpkin Pie Protein No-Bake Bites have the flavor of pumpkin pie, but are secretly packed with protein and fiber! Vegan, gluten-free, paleo, and kid-friendly. I have this thing for bites that taste like cake. And I don’t even love cake. I think it’s more of a texture thing. When it comes to desert, I would take chocolate (pie, cookies, tort, brownies, whatever) over white cake any day. It just doesn’t do it for me. But that light and fluffy cakey texture…sign me up, baby! Coconut flour is unique because not only does it lends that fabulous cakiness to sweets, but it’s also LOADED with fiber, low in fat, and naturally slightly sweet. Coconut flour is basically a gift from the baking gods. Or the no-baking gods? Most no-bake bites are loaded with nuts, which I totally adore. But….BUT, when you’re being attacked by your sweet teeth and one bite won’t cut it, it’s nice to have a low-fat version made without nuts that allows you to eat, oh I don’t know…half the batch. Doesn’t that sound fun? As cakey as it can be, it sure does need a lot of moisture. These pumpkin pie protein no-bake bites are adapted from my favorite lemon coconut no-bake bites, which use applesauce and almond milk for moisture as well. I got my coconut flour for super cheap at Trader Joe’s. Since they all differ, you may need to add a bit more coconut flour or almond milk to get the right texture. They shouldn’t taste dry, but they shouldn’t be too wet, either! Wondering which protein powder to use? I used Vega Vanilla Protein + Greens as my plant-powered protein of choice in this recipe. You can also easily make this recipe without protein powder by using the alternate recipe listed below. 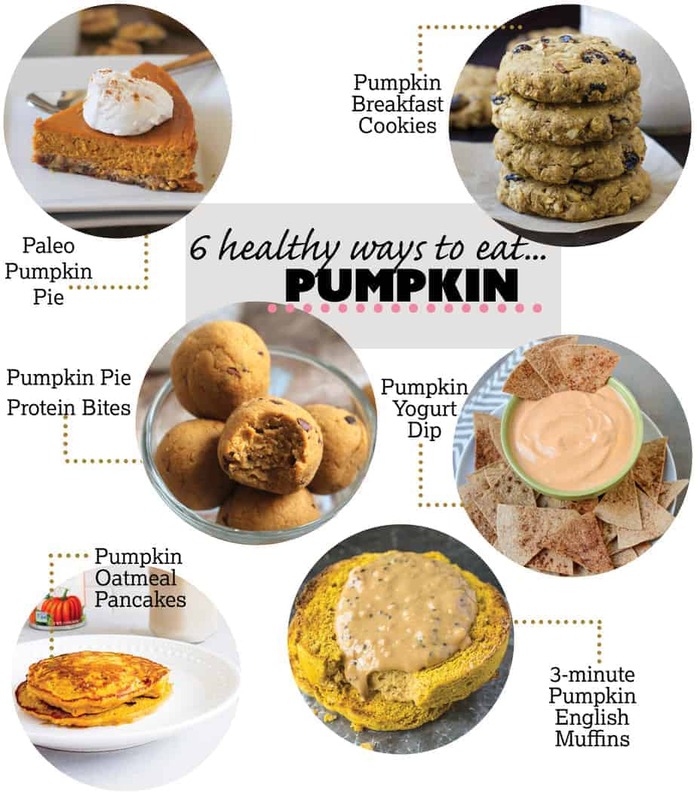 Today I’m teaming up with by blog babes Arman, Sarah, Kylie, Julia, and Lindsay to feature the nutrition powerhouse that is pumpkin. Carotenoids are the potent phytonutrients that make pumpkin orange, and there’s no shortage of these plant compounds (alpha and beta carotene) here! 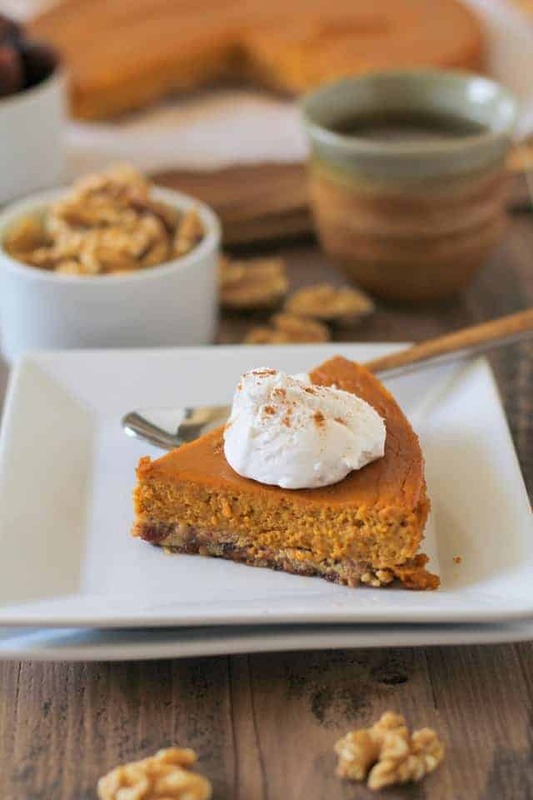 Did you know that eating pumpkin can help lower your risk of heart disease and a variety certain cancers? You’ll also get 100% of the daily value of vision-boosting Vitamin A from just a 1/2 cup serving of cooked pumpkin. Did I mention it’s super low in calories and high in filling fiber? Got leftover pumpkin? I know you’re using them in this pumpkin pie smoothie or these paleo pumpkin bars! Place dates, applesauce, pumpkin, almond milk, and vanilla in a large food processor. Blend until pureed, scraping down the sides as needed. Add coconut flour, brown rice protein (is using first recipe), pumpkin pie spice, and cinnamon. Blend until a ball of “dough” forms. If it’s too wet, add a bit more coconut flour. If it’s too dry, add a bit more almond milk. Stir in cacao nibs. Roll into 12-15 bites. Now let’s have a look-see at what the other brought to the pumpkin party! Julia brought Paleo Pumpkin Pie. Hayyyy, sweet toothie tooth! 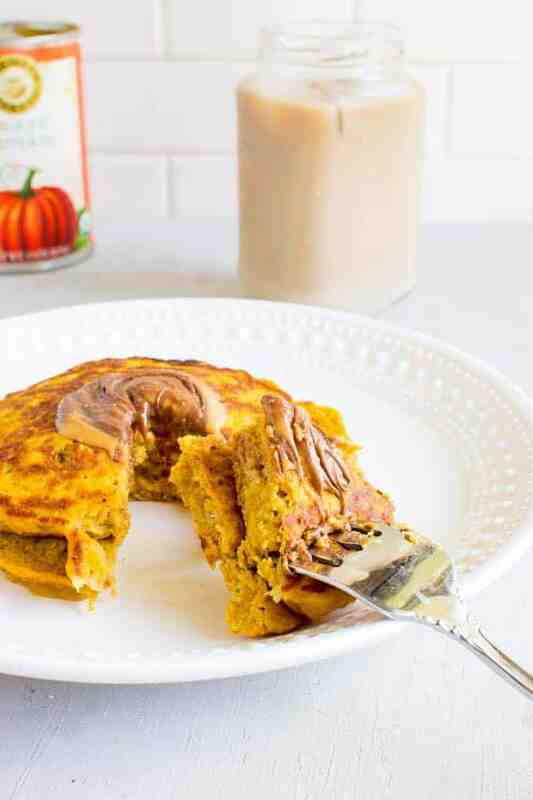 Kylie made us a delish breakfast with these Single Serving Pumpkin Oatmeal Pancakes. Got three minutes? 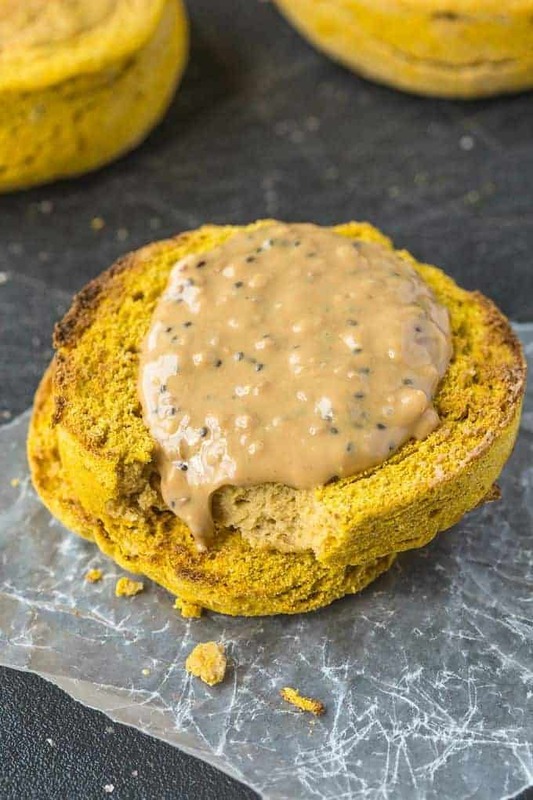 Whip up these easy microwave Pumpkin English Muffins from my bud Arman! 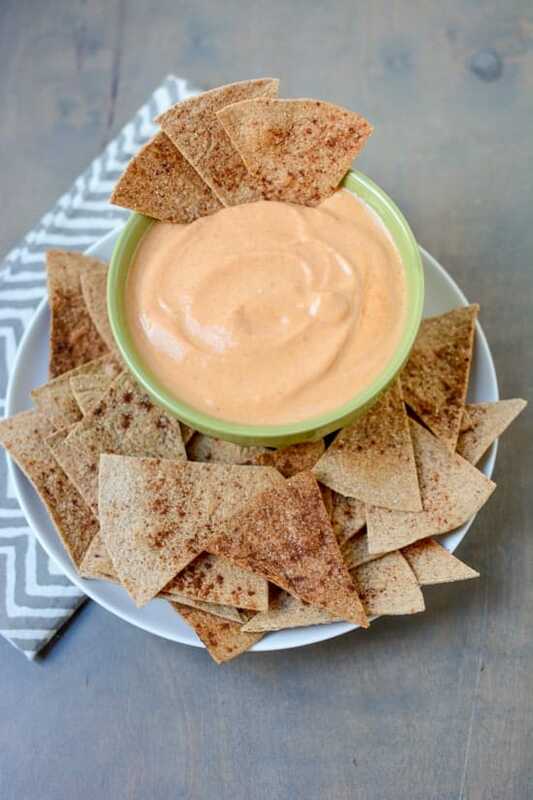 How creamy and awesome does this Pumpkin Yogurt Dip a la Lindsay look? 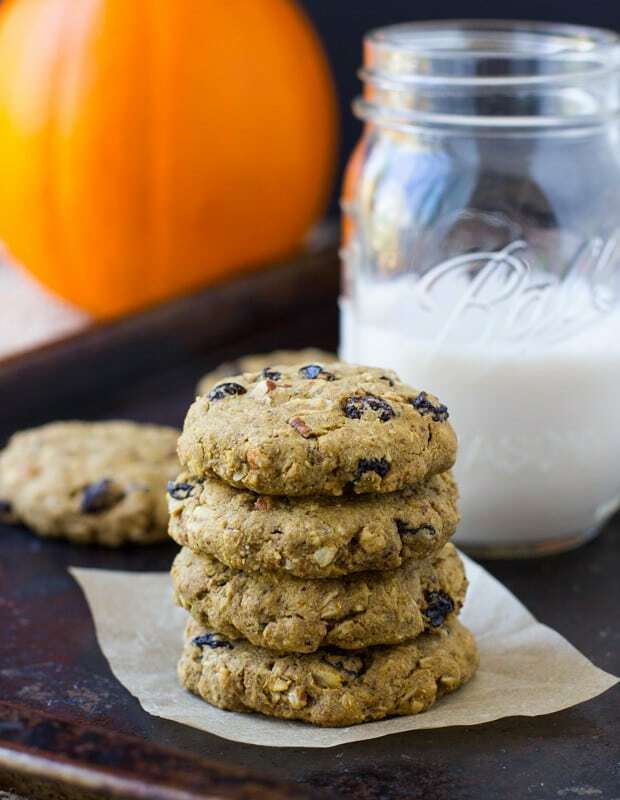 In case the pancakes didn’t fill you up, Sarah made you adorable Pumpkin Breakfast Cookies. these look lovely. i love energy bites and im bringing some to the blog today as well..
Yessss- I made your lemon coconut bites a couple weeks ago and the coconut flour really does give it a super cakey texture and I’m usually not a big fan of cake either- definitely making these this fall! They’re my faaaaaave! Seriously, I think the original will always have my heart. Could you leave out protein powder? The protein powder adds sweetness so if you’re going to leave it out I would add more sweetener to taste! Keep in mind if you’re adding more wet sweetener you may need to add more coconut flour, too. Hope it works! Have you tried this with any other paleo protein powder? I know some people can tolerate brown rice, but it’s still technically a grain – I’m on a stricter version of Paleo and have digestive issues with rice, whey and most vegan proteins. I’m currently trying to reintroduce Garden of Life Organic Protein Powder, but I may have to go back to my bone broth protein if I experience issues. These look delicious, though, and I would love to try them with my bone broth protein. Does the protein powder you suggested provide a different texture when compared to other powders? Thanks so much for being patient with all my questions!! I need more balls that taste like cake in my life, and I’m not even joking. This coconut flour idea is genius! I’m breaking the habit of using nuts in alllll my treats, so this is the perfect recipe for all those times I’m craving more than just one ball…is this conversation starting to get awkward? For realz. You would adore these and I think you should turn them into pancakes because youdda pancake kaweeeeeen. BALLSBALLSBALLS. Also, I want pumpkin everything right now. Me tooooo! Can we crumble these on top of your pumpkin pie smoothie?! Please and thanks. Thanks lady! I hope you love them! These are the hottest balls I’ve ever seen. Seriously making then happen in my mouth soon. Balls don’t get any hotter than disssss!!! 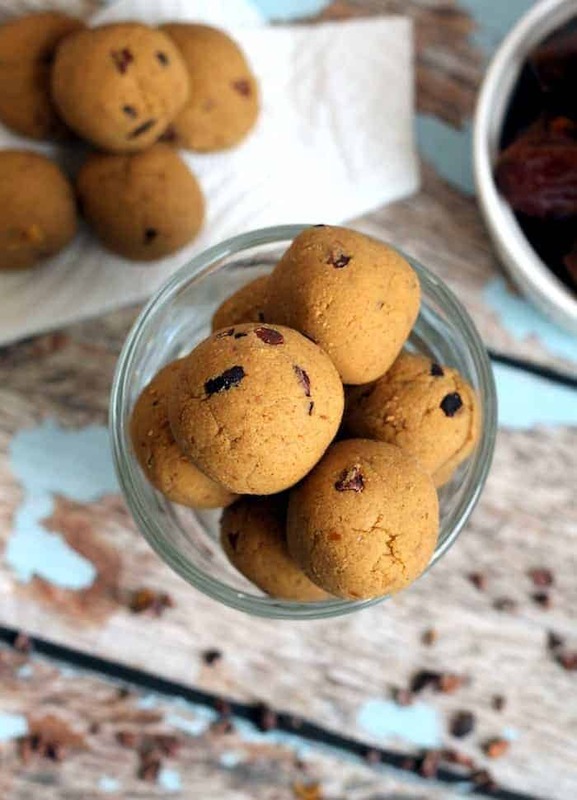 These looks wonderful and I recently fell in love with coconut flour! And so easy! All my favorites. Awwww thanks love! Ya too shweet! Yummm these look delicious!! I love easy no-bake recipes, and this one just screams FALL! Right?! The texture is EVERYTHING. Yum yum yum these look SO perfect. Pinning!! Pin away my dear! Thanks a bunch! I am totally of the opinion that there can never be enough pumpkin in my life. Let alone pumpkin balls. Me too! I always have some on hand for when the sugar beast hits…which is like every day. I made these last night to take on a road trip this weekend… well I’m not sure they’re going to make it that long because they are literally The.Best.Things.Ever! I can’t get over the awesome cakey texture. Now I’m dying to make the original lemon ones as well. Hahaha right?! They don’t last long…. now go make the other ones!! Amg! I’m a texture -freak- and these look absolutely perfect. And is it weird that I never think anything but chocolate when it comes to cake? I know white cake exists, but… why?! Thank you THANK YOU for including a protein-powder-less version!!! I really don’t think I can get anything good overseas here (in Japan) and I dunno if I like it anway?! I found coconut flour at my local Costco for the first time EVAH tonight so I think it’s meant to be!! Will be making these tomrrow for sure!!! And I’m also gonna make your recent lentil veggie soup recipe. Excited!!! I want to make these as-is because they sound PERFECT, and also because you’ve proven yourself to be the Fairy Godmother of pumpkin recipes (I’ve made both your smoothie and your bars this week), but I wanna take them to a party and am aware that there’s a coconut allergy dilemma. Is there any way almond flour or oat flour could do the trick? Hi Madeleine! You are so welcome! Unfortunately coconut flour is super unique and can’t be subbed out for another flour. Sorry!! Alexis, I have a very limited diet due to health issues. 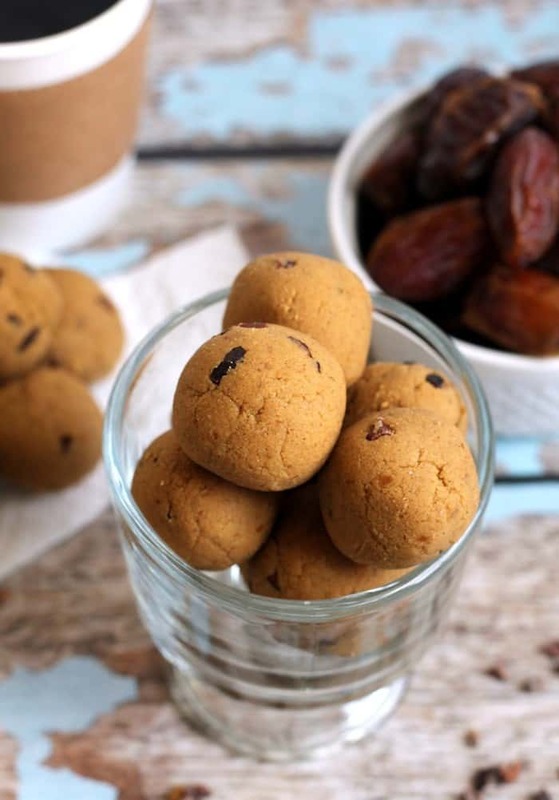 I plan to make these bites using coconut milk (the drink, not the canned stuff) instead of almond milk and agave nectar instead of medjool dates. Would that work? Hi Brenda, I using coconut milk instead of almond milk is totally fine. I’m honestly not sure how well agave would work, but I would just add a bit at a time for sweetness and texture until a dough forms? Hope that helps! These look great! I always worry about experimenting with coconut flour because it can make things really dry but I’m excited to try these. I have mini chocolate chips that would be perfect too! You can use any flour or flax instead if you’d like! All of these look amazing :D I definitely need to try your protein bites and those cookies from Sarah! Give them a whirl! You won’t be disappointed! I just made these this morning, and they are SO good. I just pulled one out of the freezer — it was like a beautiful fusion of pumpkin pie and pumpkin cake. Thanks for the recipe! Mmmmmm isn’t pumpkin cake the BOMB?! Obsessed with pumpkin. Can’t wait to try some of these recipes! hmm, if i just had vega natural, any suggestions? Made these yesterday as my ball of the week! It was, um, an experience… I don’t really know what the problem was. Maybe my dates were too dry? They were moist enough that I could fairly easily rip them open to extract the pits with my bare fingers. But maybe that’s not all that moist? I’m not TERRIBLY familiar with dates. I’ve only used the same ones from the bulk bins at my regular grocery store so I don’t have anything to compare them to. So it was either them or the food processor. Either way, as soon as I turned the machine on with the dates and wet stuff, my kitchen took on a new, decidedly orange appearance. I unlocked and re-locked the lid a few times to make sure it was on right, but that changed nothing. There were splatters of wannabe-ball halfway across the kitchen. It was awful. After a bit of grump and consideration, I removed as much of the liquid as possible (and the few smaller chunks of date that had been chopped off), set that aside in a bowl, and pulsed the dates into near oblivion while holding folded up paper towels around the oozing fissure between lid and bowl. I then added half of the liquid back in, pulsed some more, and then scraped the rest of the liquid back in. That managed to do the trick, and I eventually ended up with some amazingly delicious balls! I did the protein version and did add some dairy-free chocolate chips. My boyfriend, who hasn’t been able to have dairy for years now, was tickled by how much they tasted like cookie dough: an indulgence he craves on occasion but can’t do anything about. So I’m tickled I’m able to provide for him in that way. And I just love pumpkin. Love, love, love. I’m hoping these firmed up more overnight, as they were rather soft even after a few hours of refrigeration. If not, I might try freezing them to see how that does. I’m a bit of a texture freak. :D Thanks so much for the recipe! Hello! These look great! Wondering what i could use instead of dates? I can’t have them or any type of dried fruit. thanks!! What are the numbets…calories, protein, carbs, ect? Is one bite a serving? Hey Melissa, you can visit MyFitnessPal.com to import the recipe for nutrition stats. Thanks! Since I haven’t seen this question in the comments, any suggestions for what could substitute for the apple sauce? My doctor just put me on strict diet and I can’t have any fructose :( but I’m dying for some pumpkin goodness during this fine Fall season! These look so delicious!! Love anything pumpkin for fall! I have spent the past almost hour trying to make these and I am about to pull my hair out. I’ve added almost 3 cups of flour and they are still so sticky I have to use my steel wool brush to get it off my fingers. I am giving up. That’s so strange! I’m so sorry that happened, maybe something was up with the applesauce or pumpkin purée? I made them this morning, and they turned out deelish! My husband is addicted to your Pumpkin smoothie so I am sure when he gets home this will be added to his list of favs! Thank you for yet another great recipe! OMG! I made the non protein version last night (minus chocolate chips) and they are AMAZING! Planning on making a big batch to bring to work next week! I’m allergic to coconut so can I use normal flour for the recipe? One is not going to do anything for me . Hi, Heather. I have had vast experience with the Paleo diet after going on it a couple years ago to experiment with resolving some minor health issues. I also successfully coached my father-in-law through the more restrictive autoimmune protocol, and we saw an amazing reduction in symptoms of his rheumatoid arthritis. He went from being bedridden 9 months ago to walking with the assistance of one cane – this is after he was told by traditional doctors to keep taking steroids and pain meds and that he would likely die early. The more I eat this way, and the more I research, the more I’m convinced that Paleo is the way to go. I certainly wouldn’t discount recipes based on the fact that they are gluten-free/paleo/vegan. You can cook some INCREDIBLE food that’s entirely Paleo. I prefer not to buy gluten-free foods in the grocery store – not only are they heavily processed, but you are absolutely right. They don’t taste very nice and I find that cooking things myself gives me more control over flavor profiles and nutritional content. I know how scary and unnerving it is to start Paleo, but you can do it, and I am absolutely more than willing to help if you have any questions. There are lots of people who follow special diets that require certain ingredients. If you see the reviews on this recipe, you’ll notice they’re enjoyed by all. Those who follow certain diets deserve to have tasty treats, too. No need to be judgmental here, especially when you haven’t tried the recipe. You can respect that this recipe serves others even if it’s not for you. I tried a recipe which looks like this a week ago and it was delicious! ı can’t wait to try your’s! Just made these and they are absolutely delicious! Only change I made was adding just a little extra pumpkin because I absolutely LOVE a lot of pumpkin flavor in everything. This is a great recipe, I’m obsessed with them! Thank you for sharing!